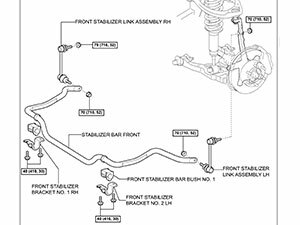 After performing a suspension lift on the Toyota 4Runner, the sway bars will be in a different position than they originally were due to their mounting points moving. 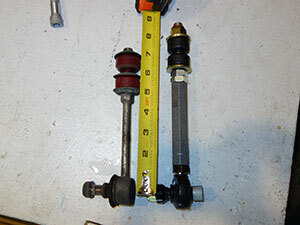 The main reason for installing adjustable sway bar end links is to have the ability to adjust the length of the end links in order to remove any pre-load from the stabilizer bars. 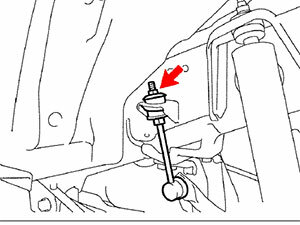 If your vehicle is on level ground and you unbolt one end of the sway bar, the bolt should be able to slide in and out of the bar without friction, otherwise it is pre-loaded. 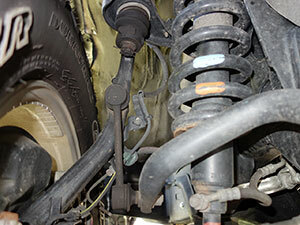 Ideally you would want to have no load and have the sway bars be in a neutral position. 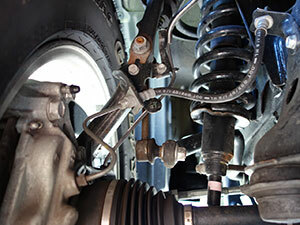 While it is preferable to be able to have the sway bar set parallel to the ground, it is not imperative. As long as there is no load on either side it should not cause any issues with not being 100% parallel to the ground. 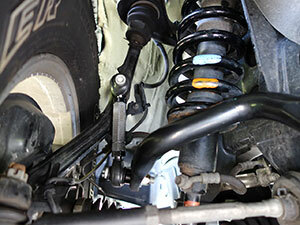 Just ensure that the bar does not come in contact with anything during full suspension travel. Other reasons for upgrading the end links from the factory OEM versions include longer life, greater strength and reliability. 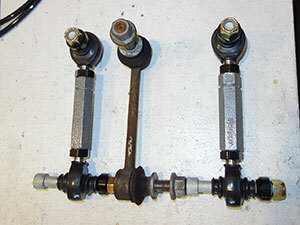 The Adjustable Sway Bar End Links I purchased were custom made by toyota-4runner.org forum member Mike "Mstudt". Please reach out to him directly for ordering information. 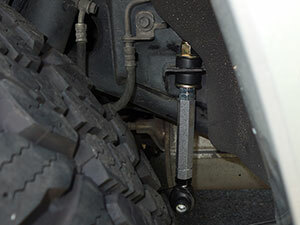 The front factory OEM Toyota 4Runner end links are 5.50" long as measured center of ball id to center of ball id. I have the front aftermarket adjustable end links set at approximately 6.00". They can still be adjusted about 0.50" longer. For reference, my 4Runner is lifted in the front by 3.50" via a two part Daystar spacer system. 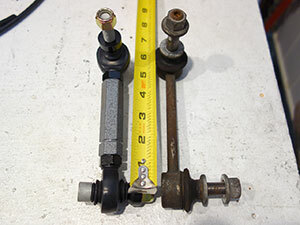 The rear factory OEM Toyota 4Runner end links are 5.75" long as measured center of ball id to center of top bushing set. I have the rear aftermarket adjustable end links set at approximately 7.00". They can still be adjusted about 0.25" longer. For reference, my 4Runner is lifted in the rear by almost 3.00" via a Daystar spacer (2.25") and FJ Cruiser springs (0.75"). 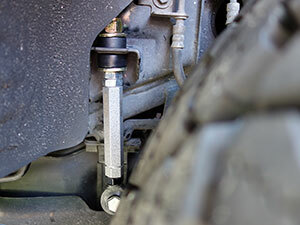 The front end links can and should be removed while the vehicle is on the ground. There is no need to remove the wheels. 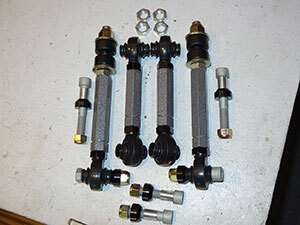 Remove the 2 nuts and the front stabilizer link assembly. 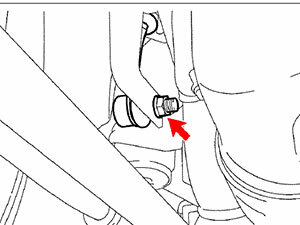 If the ball joint turns together with the nut, use a 6mm hex wrench (allen key) to hold the stud. Installation of the new adjustable front end links are simple too. Loosely install the 3.00" bolts up top and the 2.50" bolts down below. 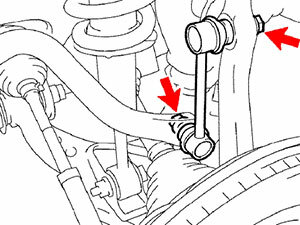 Then turn the hex bar end link body to extend the link to where it looks/feels like it is in a neutral position and there is no resistance when sliding the lower bolt thru the sway bar. 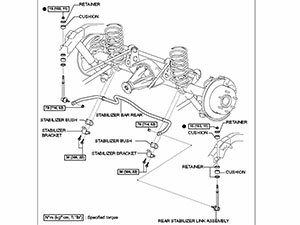 I erred a little bit on the shorter side to ensure that I would not come into any suspension or brake components during suspension flex. Then torque the bolts to about 52 ft. lb. 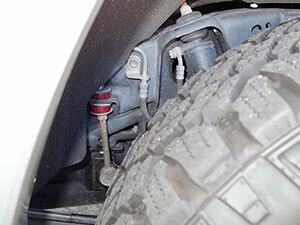 The rear end links can and should be removed while the vehicle is on the ground. There is no need to remove the wheels. Start by removing the top nut holding the end link to the frame mount. A ratcheting flex head wrench is very helpful here. 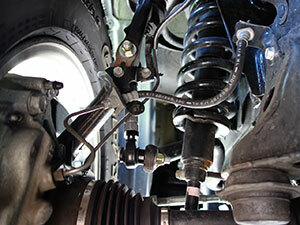 After that is removed, take off the nut holding the end link bracket to the sway bar. If needed a 6mm hex wrench (allen key) can be used on the back to hold the bolt from spinning. 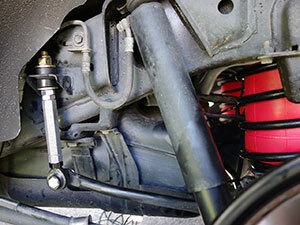 Installation of the new adjustable rear end links are simple too. I set up the torque on the top nut and bushings first taking care not to compress the bushing too much. 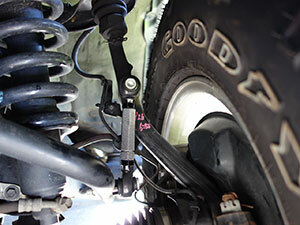 Then adjust the link so there is no resistance when sliding the lower bolt thru the sway bar. Just don't make the link to long or it will hit the parking brake cable when flexing. Then torque the lower bolt to about 52 ft. lb.